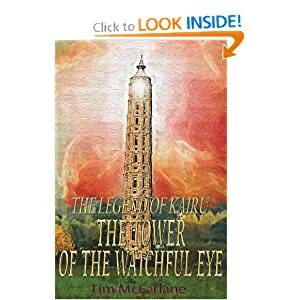 This week we have another special guest: Tim McFarlane, author of The Tower of the Watchful Eye, available to buy from Amazon now. No, seriously - right now. And there's only 17 left in stock on Amazon.com, and only ONE left on Amazon.co.uk, so don't mess around. There's also a Kindle edition! McFarlane's book has received 4-5 star reviews on both Amazon's US and UK sites, and earned him a loyal fanbase on free book site wattpad.com. The Tower of the Watchful Eye is the headquarters for the Order of Magic, a secret group of Mages that controls every aspect in the provinces of Kalenden. Young children that show magical abilities are whisked away from their families to be trained as an Apprentice. This is how Andrew ‘Andy’ Holcombe first arrived at the Tower and after a childhood of study it is time for him to choose his destiny. The Order’s influence runs deep in a world of turmoil and the citizens are ready for change. It will be up to Andy to decide what type of world is the right one. But first he is going to have to overcome his inner Demons, with a little help from one. For me, the characters of a story are the most important part. From the main character down to the guy that shows up once, if they aren’t engaging, relatable or just plain entertaining, it will take away from the story. Your characters are the bridge that allows the reader to cross over from the real world into the story world. This is where learning character growth and development plays an important role in writing. Like real people, each character is different. They’ve grown up and faced different circumstances throughout their lives that have caused them to become who they are. Before putting a single letter on a page of your story, you should first construct the whole life of your main characters up to the point of your story. Get into the character’s shoes and think like they do, ask yourself how you would deal with situations. If your character has suffered the lost of his wife and kids due to apocalyptic circumstances, how would they act? How would you act? The more you break the character down, the more real they will become. The realer they are to the writer, the realer they will be to the reader. Growing your characters through a story can be the tricky part. Changing traits of a character requires a subtle touch. Too often you will see a reluctant main character suddenly become accepting because they feel guilty for not helping in the first place or a secondary character will suddenly betray the group while hasting explaining why afterwards. It’s one thing to throw in a twist. It’s another thing to have stuff come out of nowhere. This is why subtly plays an important part. The best way to achieve this is to think back five years and remember who you were in comparison to who you are now. Maybe find an old diary or look through old messages of facebook. The changes between then and now seem drastic because you’ve never realised that you’ve grown and changed slowly over the years. The same could be said about your characters in the shorter time frame of your story. Turning this character into a hero requires him/her to overcome each previous “weakness” on their quest. The apathy can be overcome by the simple acceptance of the character into the world. Feeling like the character belongs and, maybe, is important in the world are strong first steps. But apathy won’t be completely removed until the character is made to care about the people like they are family. There is no greater destroyer of apathy than a personal connection, after all. Your main character is going to make friends with the people around them, either by choice or circumstances. The growing bond between your characters will not only help your MC come out of their shell and gain self esteem but when it comes time to start the turmoil and the secondary characters are threatened, the MC will have a justified response to fighting back. Their war is now his/her war. To further help with the character’s self esteem, your MC should overcome task and minor plot points during the course of your story. The sense of accomplishment will help your character grow and give them the confidence to tackle bigger and bigger task. Tie this in with your character building their physical strength through training and adventuring and it is no wonder they are taking down dragons or toppling empires. As important as the main character is, they are nothing with a good supporting cast. It’s easy to put together a group of people that each has their own “type” and have them follow your hero around everywhere but it won’t give the reader the full experience. Secondary characters need a back story too. With each character you need to ask “Why”. Why is your tough guy/girl tough? Do they do it to hide their cowardice or is it just they way they had to be to survive their childhood? Why is the funny guy/girl funny? Are they hiding their pain behind their humour or are they just simple a good natured person who understands the importance of humour during stressful times? These characters, though secondary in your MC’s life, are main characters in their own life. They are assisting the MC in his/her quest but have their own lives and problems they are dealing with. The MC can help them with their problems or the character could keep them hidden away until it comes back to bite them on the backside. But what about the background characters that maybe have one or two lines in the book? It would be hard to justify coming up for an entire history for a clerk at a market but they can’t all be cardboard cut outs without any personality. The best way to create these characters is to just take random people you’ve encountered in your life and plug them in. Instead of a generic clerk, you have a clerk with long painted nails, hoop earrings and way too happy to serve you. Watch out for her long nails though otherwise you will be scratched when she returns your change. It’s not very important information to the story but it populates your world with relatable characters and gives a sense of realism. In the end, that is what all of your character’s jobs are. They are the bridge between our world and theirs. Through growth of your main and secondary characters and the proper development of all your characters, your story will take twist and turns you never planned as each character begins to take on a life of their own. If you like the sound of Tim's process and his thoughts on character building, then try his book! You can also check him out on wattpad , his blog, and on twitter @SmoothMoveKairu.